Enter your dates to pick from 372 hotels and other places to stay! Featuring a garden, terrace and free WiFi, Hotel Zetta Douala is located in Douala, 3.8 miles from Santa Lucia Complex and 7 miles from L'Atrium Shopping Mall. I usually never leave reviews but for this, I had to! My partner and I have just returned from a trip to Douala and stayed at this hotel. I didn't know what to expect but I was pleasantly happy with the level of comfort in our room. The room was just what we needed with AC, TV, and hot water always working. The hotel gives you a sense of home feeling. I would definitely stay there again and recommend! Located in Douala, Cityzen Hotel has free WiFi. 4.1 miles from Santa Lucia Complex, the property is also 5 miles away from L'Atrium Shopping Mall. The property features a restaurant. Located in the heart of Yaoundé, La villa des lys has a garden and a terrace. The property features a bar, as well as a restaurant serving Mediterranean cuisine. The owner was always available to answer our questions before and during our stay. We stayed with 12 people here and highly recommend this location and hotel. The owner went above and beyond for us and we thank him very much for all his help. Please stay at this hotel!! 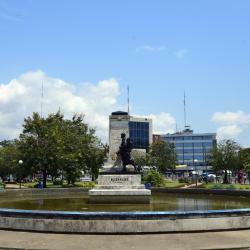 Located in Douala, A. Grand Hôtel is 3 miles from L'Atrium Shopping Mall and provides facilities like garden, terrace and bar. With free WiFi, this 3-star hotel offers free shuttle service. Great service. Food was excellent. Room was very comfortable. The best hotel that I’ve stayed at in Africa! 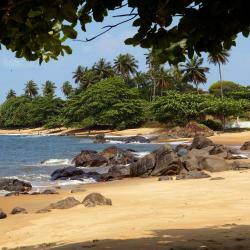 Hotel Le Cardinal in Kribi provides accommodations with a private beach area and a garden. With free WiFi, this 2-star hotel offers a 24-hour front desk. The staff was very friendly and helpful. Noubou International Hotel is located in Douala, 1.3 miles from Akwa Stadium and 1.4 miles from L'Atrium Shopping Mall. All staff were very kind and helpful. The room and bathroom facilities were great. Very neat and clean and lounge, eating, drinking very nice. 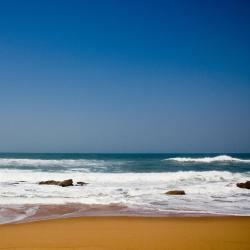 Located in Kribi, Hotel Lobe has a terrace and shared lounge. Featuring a bar, this 1-star hotel has air-conditioned rooms with a private bathroom. Rooms are clean and staff are friendly. hotel looks better than in the pictures. The hotel is also not far from the Lobe falls and other free beaches. Offering a restaurant, Hotel Serena Akwa-Nord is located in Douala. Free Wi-Fi access is available. Rooms here will provide you with a TV, air conditioning and a seating area. Offering a restaurant, Hotel Minotel Vallée Des Princes is located in Douala. Free Wi-Fi access is available. Rooms here will provide you with a TV, air conditioning and a balcony. Offering an outdoor pool, a spa and wellness center, La Vallée de Bana is located in Bana. Free Wi-Fi access is available. Well trained staff, comfortable and clean facilities. Great location. Nice for weekend getaways with much to do on site but little to no nightlife in the area. Offering an indoor pool and a restaurant, Hotel La Falaise Yaounde is located in Yaoundé. Free WiFi access is available. Each room here will provide you with air conditioning. The room was very practical yet felt rather luxurious. I am very particular about hygiene and this room exceeded my expectation in terms of cleanliness. The staff were extra polite and helpful, especially Romain our very competent bellhop. Hotel Résidence La Falaise is located in Douala. Free Wi-Fi access is available throughout as well as free private parking onsite. It was like safe heaven from outside environment ! Boasting an outdoor swimming pool and free Wi-Fi access, Hotel Merina is located in Yaoundé. The guests can enjoy a drink at the onsite bar and relax in the garden. It’s very old hotel and lots of maintenance issues. Rooms are not comfortable at all. Wifi is just pathetic. Ibis Douala in Douala has an outdoor swimming pool and a terrace. With free WiFi, this 3-star hotel offers free shuttle service and a 24-hour front desk. A welcome respite for the weary traveler. The hotel was nice, clean, comfortable and neat. They have made the best of the technology and provide free Wi-Fi as well. Breakfast was good and included in the room price. Featuring a terrace and shared lounge, Girafe hotel yaounde is located in Yaoundé, 1.1 miles from French Institute of Cameroon. Hotel mangwa palace in Mbouda features 3-star accommodations with a terrace and a shared lounge. This 3-star hotel offers a bar. The property has a 24-hour front desk and free WiFi is available. Located within 1.4 miles of Douala Museum in Akwa, byblos palace has a shared lounge and a bar, as well as free WiFi. This 1-star hotel offers free shuttle service.